How do you show up as a leader in all areas of your life? Mario Lanzarotti is an entrepreneur, speaker & coach dedicated to empowering people towards living their best life. His multicultural experience spans from Berlin to Cape Town and New York City. He collaborated with the Fashion Week Berlin, The Russian Embassy and helped start up Uber in the German capital. When arriving in NYC in 2014, he interned for custom shoe company Awl & Sundry and became a partner after only 3 months. Over the course of the next 3 years, he launched 3 successful Kickstarter campaigns, facilitated exclusive collaborations with Sony's The Blacklist, NFL Super Bowl Champion Kam Chancellor and many more. His emphasis on hustle, workplace communication, and the journey from intern-to-partnership galvanizes change across organizations. Looking to make a difference? Look no further. 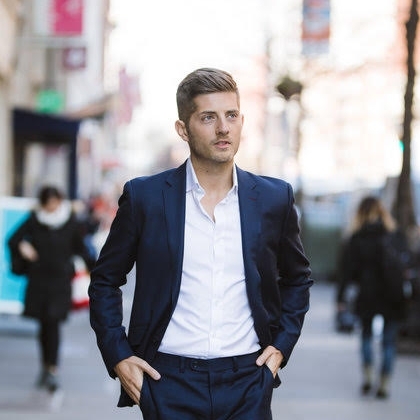 Mario Lanzarotti is a German/Italian entrepreneur, speaker & coach with a background in fashion, marketing, and self-development. His strong dedication to bringing out the best in people allowed him to gain multicultural experience that spans from Italy to Berlin to Cape Town to New York City. He created events in collaboration with The Fashion Week Berlin, The Russian Embassy and helped start up Uber in the German capital. In 2014, Mario went from intern to partner at NYC custom shoe company Awl & Sundry in only 3 months. After leading 3 highly successful Kickstarter campaigns, exclusive NFL partnerships with a Super Bowl champion and many more exclusive brands, Mario is now leading Awl & Sundry as the COO. Mario's true passion is brought to life in his role as empowerment coach & speaker. His mission: Empowering people towards living their best life!